THE FAT AND THE FURIOUS Perry’s popular franchise continues with the split-personality tale of a raging granny and a winsome whore. On the weekend of October 12, 2007, the highest-grossing movie in America was Tyler Perry’s Why Did I Get Married? You wouldn’t have known it in Burlington, where that flick never opened. Made on small budgets, released on slow weekends, Perry’s movies do so well that the Atlanta-based writer/director/producer/actor/studio head deserves to be called a phenomenon. His core audience has always been middle-aged African-American women, which may explain why his movies seldom land in our theaters. But for evidence that Perry has crossover appeal, one need look no further than a recent showing at the Majestic of his latest, Madea Goes to Jail — which won the national box office handily last weekend. While the audience was more diverse than the average group of Vermont moviegoers, white folks were still a majority. And everybody seemed to be immensely enjoying the antics of Madea, a straight-talkin’, gun-totin’ grandma character that Perry himself plays in a fat suit and drag. Till the last half hour, all that ties these two plots together is a courtroom. 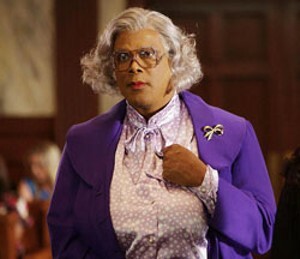 In the comic portion of our entertainment, lawless matriarch Mable “Madea” Simmons is hauled before the judge after a road-rage incident, then struggles (not very hard) with her anger issues. In the serious portion, handsome assistant D.A. Josh Hardaway (Derek Luke) gets in trouble with his high-powered lawyer fiancée when he tries to extend a helping hand to a surly prostitute (Keshia Knight Pulliam), whom he knows from his youth. Oscar nominee Viola Davis appears as a grim-faced preacher who tries to reach out to the streetwalkers, and her no-nonsense gospel gives the film’s dramatic sections a bit of gravitas. Pulliam, best known as little Rudy from “The Cosby Show,” uses her big doe eyes nicely in the Fallen Woman role. Still, this is an ultra-simple morality tale with a message that’s obvious from the beginning: No matter how high you rise, never forget where you came from. For all the Christly ethics embedded in this movie, it comes down to several set pieces in which a growling underdog takes down the world’s fat cats. Elderly ladies with paunches and bad attitudes have their own superhero — and it’s about time.